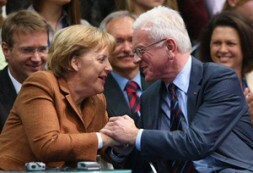 Prof. Dr. Hans-Gert Poettering MEP here with German Chancellor Angela Merkel: "The developments in the Arab world provide a great opportunity for the Arab nations as well as the rest of the world. The most important issue is that the Libyan people have the right to make choices about their own future. The Libyan people have the right to democracy." Prof. Dr. Hans-Gert Poettering is Germany's most influential politican for European affairs as he has been a member of the European Parliament since its adoption in 1979 and held presidency from 2007 to 2009. He is also a member of the Executive Board of the governing Christian Democratic Union (CDU) and a close advisor to Chancelor Angela Merkel and President Christian Wulff. As the President of the CDU associated Konrad Adenauer Foundation (KAS) he is involved in many countries where the KAS is represented. In 2004 and 2009 he promoted his friend Jose Manuel Barroso to become President of the European Commission. When he argues about Libya, democracy in the Arab world, and what the EU should do, they all listen to his advice. The Libyan people must decide their own future and have the right to democracy. The development in the Arab world is a great opportunity. Democracy and Islamic belief are no contradictions. The EU should support this development and help including institution building, the new legal status and NGOs with financial support. The Mediterranean Union requires a concrete policy to support economic change and open the markets for North African agricultural products. All people have the right to live in a society where they can decide about their future and this can only be achieved in democratic societies. The EU should be more engaged to support a two-state solution for Israel and Palestine. There must be a peace solution soon. Hans-Gert Poettering - for whom I had the privilege to work as an assistant for several years - promotes a more active European policy with its southern neighbours.